A male parent caring for a brood of young fish. But are all the youngsters really his own? Males and females of many species form close social bonds, coupling to mate and raise offspring, but these pairs are not necessarily sexually exclusive. In many cases, males wind up getting cuckolded, meaning that other males also mate with their socially bonded female and sire offspring with her. This behavior is widespread across the animal kingdom. Cuckoldry is typically bad news for the cuckolded male because he loses paternity to other males and may even waste his limited energy caring for offspring that are not his. When faced with the threat of cuckoldry, what should a male do? In recent decades, evolutionary biologists have uncovered myriad animal behaviors that are thought to have evolved in response to cuckoldry among males. For example, males of some species vigilantly guard their partner from competitors. Others reduce the amount of parental care they provide when they are skeptical about their paternity, or even kill offspring that are unlikely to be theirs. These behaviors allow males to either avoid or lessen the negative impacts of cuckoldry. Males and females in this species [Variabilichromis moorii] form socially monogamous pairs, but males face extreme competition for paternity from a large number of cuckolders. In our study, we tested a novel way that males could mitigate the impacts of paternity loss – by pairing with a related female (i.e. by inbreeding) and/or by tolerating cuckolders that are relatives. In either scenario, the cuckolded male would still be somewhat related to the offspring that other males sire with his partner. Thus, even when the cuckolded male fails to sire all the offspring produced in a mating event, his evolutionary interests do not suffer as severely. This is because any genes that he shares with his relatives could also be passed to future generations. However, inbreeding is known to carry a host of downsides and lost paternity is still costly for the cuckolded male even if it is lost to a relative. We consequently wanted to find out if such a system, where the costs of cuckoldry are counteracted by breeding among relatives, could really evolve in nature. To study this question, we focused on Variabilichromis moorii, a territorial cichlid fish endemic to Lake Tanganyika in east Africa. Males and females in this species form socially monogamous pairs, but males face extreme competition for paternity from a large number of cuckolders. In our species, cuckolder males are typically unpaired ‘bachelors’ in the population who seek out opportunities to steal paternity from already paired-up males. The field site is located off Crocodile Island, named after its shape but, as we experienced, not devoid of the dreaded reptile. 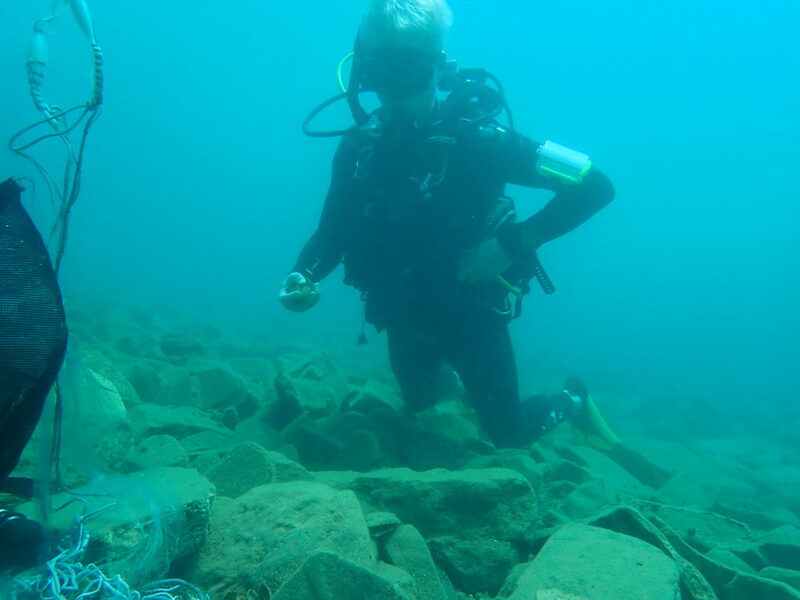 V. moorii nests investigated in the study occur on rocky lake bottom at depths of 3 to 10 meters. We visited a wild population and took genetic samples from a large number of breeding adults and their offspring. Back in the lab, we used genetic tools to reconstruct the relatedness between all types of breeding individuals (paired males, paired females, and cuckolders). As expected, we found that male V. moorii were frequently cuckolded, sometimes by as many as five other males. But more intriguingly, we found that paired males were also related to some of their cuckolders, more so than could be expected by chance. Therefore, some mechanism seems to be at play to cause paired males to tolerate being cuckolded by their relatives or cause unpaired males to prefer cuckolding their relatives. The kinship pattern we uncovered was intriguing: males were related to the offspring in their nests, even those they didn’t sire! This situation could only arise if paired males are related to either their partners or their cuckolders, and our genetic analyses pointed to the latter. Spurred by these observations, we developed a mathematical model to understand why paired males might evolve to tolerate cuckoldry by relatives, and why cuckolders might seek out their own male relatives. 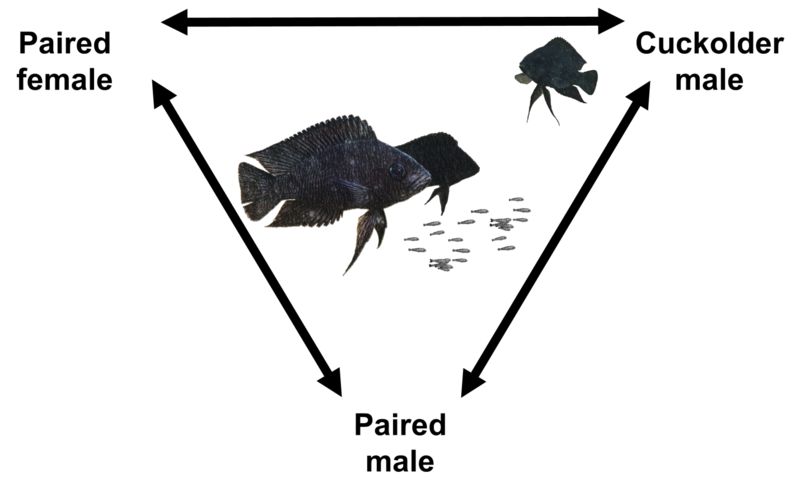 We reconstructed relatedness between paired males, paired females, and cuckolders. Our model predicts that cuckoldry among relatives can be favored by evolution, but only under particular conditions. Most importantly, there must be intense competition among multiple males to fertilize females’ eggs, just as we see in V. moorii. When competition is fierce, paired males and their cuckolding relatives are partially aligned in their interests: they would both rather help each other than lose out to some unrelated male. This could lead to cuckolders targeting related paired males, who ‘cooperate’ by tolerating their relatives rather than driving them off. Kinship between individuals has played an important role in evolutionary theory since the 1960s. Incorporating high-quality relatedness data into empirical studies remains a challenging undertaking, however. Here, we show that exciting new insights into animal mating systems can be gained by closely examining the relatedness between mating partners and their competitors. Aneesh is a behavioral ecologist who achieved his PhD in the lab of Dr. Sigal Balshine at McMaster University (Canada) studying parental care and alternative reproductive tactics in toadfish. During his first postdoc with Dr. Kristina Sefc at the University of Graz (Austria), he studied patterns of paternity and parental care in African cichlids. He is currently continuing his work with African cichlids in the lab of Dr. Alex Jordan at the Max Planck Institute for Ornithology (Germany). Aneesh is fascinated by the diversity of reproductive behaviors and the complexity of mating systems that exists among fishes. Jonathan is a theoretical biologist interested in the evolution of fertilisation, mating behaviour, and parental care. He did his PhD with Profs Hanna Kokko and Michael Jennions at the Australian National University. He is currently a postdoc in the lab of Prof Adam Jones at the University of Idaho. For more info see his website. Kristina is a professor for evolutionary biology at the University of Graz, Austria. About 20 years ago, she started to use microsatellite markers to reconstruct parentage and relatedness, first among grapevine cultivars and later in birds and fish. Her lab studies behavior and evolution of cichlid fishes.